Donnelly Centre teams have netted the competitive Medicine by Design grants for research projects that range from overcoming blindness, to shedding light on brain repair and finding new ways to make blood. The $27 million investment will be shared over three years between 20 University of Toronto teams, five of which are led by Donnelly Centre researchers. The awards champion teamwork among experts from different fields, including molecular geneticists, computational biologists, engineers and clinicians, aimed at expanding our knowledge of stem cell biology and translating it into practical use. Among the Donnelly Centre team leaders are University Professors Michael Sefton and Molly Shoichet, and Professors Cindi Morshead, Gary Bader and Jason Moffat. 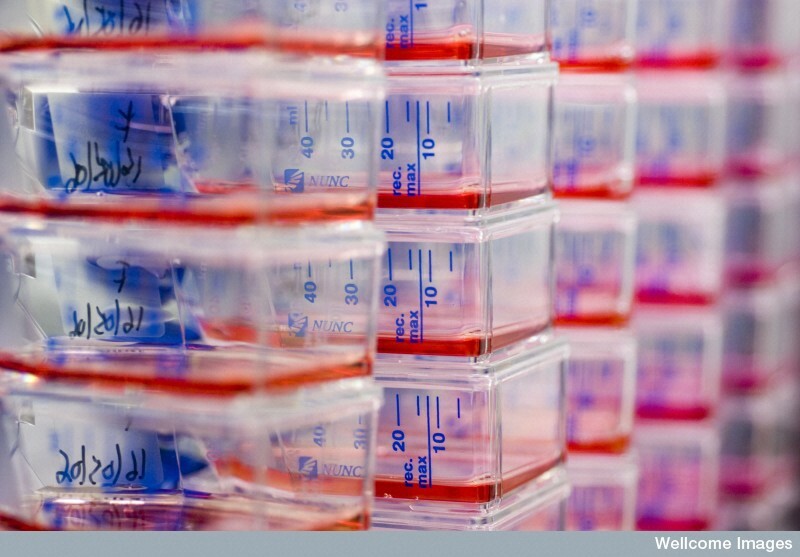 stacks of laboratory dishes used for growing stem cells (wellcome trust images) Stem cells hold great potential for making replacement tissues thanks to their ability to turn into any cell type. Scientists hope to harness this potential to treat injury and disease. The Shoichet team has taken on blindness: the team is creating replacement retinal cells to stave off vision loss due to age-related macular degeneration. They are investigating how best to grow and transplant cone photoreceptors, the cells responsible for central vision. In addition to growing transplant cells in a dish, it may also be possible to coax our own stem cells to repair damage from within. All major organs have stem cells that drive tissue maintenance and repair, but this process is slow and not geared to replacing entire organs. The Sefton team is investigating a possibility of tricking the body’s muscle stem cells to form entire muscles in order to replace tissue lost to trauma or surgery. They are using "living" scaffolds, created in the lab from biomaterials that spur blood vessel growth, as a surface for the stem cells to grow on and form a functional muscle. 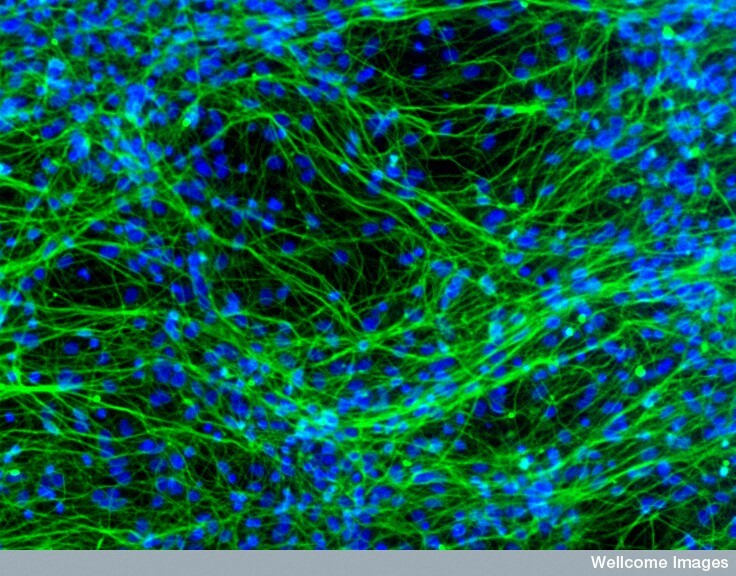 neurons grown from stem cells (wellcome trust images) Even the brain, previously thought to be incapable of regeneration, has its stock of stem cells. The Morshead team is investigating whether brain stem cells could be used to repair damage caused by stroke. Gary Bader and colleagues are taking a computational approach to map genetic circuits that control how stem cells form the most complex organ in the body, in order to shed light on the fundamental processes in brain development, disease and aging. These insights will pave the way for future drug-discovery and cell-based repair therapies. Jason Moffat’s team will use the grant to create a roadmap for turning human stem cells into blood stem cells, which reside in the bone marrow and make blood. A greater understanding of this process should make it possible to create blood stem cells directly from patients’ tissue and deal in one stroke with the challenge of finding a suitable bone marrow donor and immune rejection. See the full list of funded projects. Learn more about how the $27 million investment will advance stem cell research across U of T.
Medicine by Design was created last summer after the federal government gave the University of Toronto the largest single research award in its history – $114 million – to accelerate research in regenerative medicine. It is led by Peter Zandstra, a University Professor in U of T’s Donnelly Centre and Institute of Biomaterials & Biomedical Engineering and the Canada Research Chair in Stem Cell Bioengineering.